The offense that had been held to two runs or fewer in the past five games awoke from its slumber in a 6-2 victory over Texas. 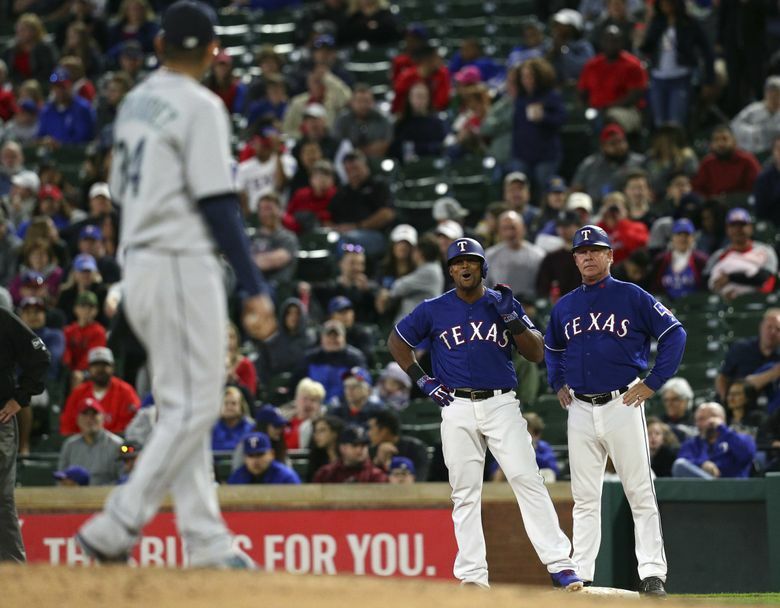 ARLINGTON, Texas — The Mariners weren’t facing the likes of Lance McCullers, Gerrit Cole or Charlie Morton, but it took them a little while — roughly the first seven innings of their matchup with the Texas Rangers on Friday night — to realize it. But the expected potent offense that had been held to two runs or fewer in the past five games awoke from its slumber in an impressive fashion in a 6-2 victory. 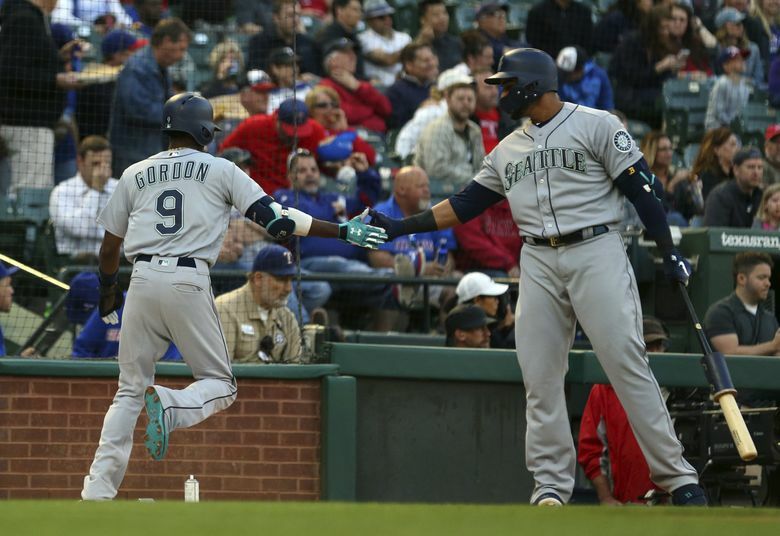 Jean Segura’s two-run double in the top of the ninth broke a 2-2 tie and ignited a four-run inning, allowing the Mariners to pull away to snap a three-game losing streak. The breakout inning easily could have come earlier in the game. The Mariners had plenty of base runners. But they couldn’t seem to drive them in against Rangers starter Mike Minor. They scored one run in the first inning, but then stranded base runners in the second, third, fourth, sixth and seventh innings. Well, the execution on the offensive side wasn’t always there. 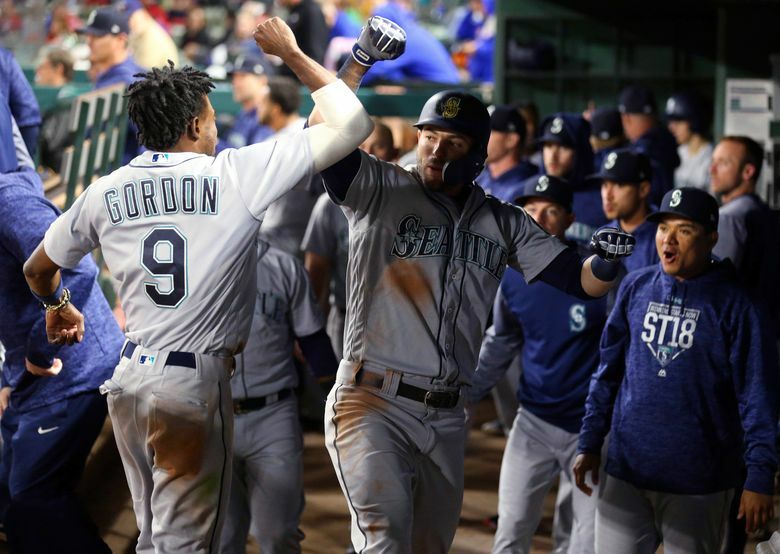 In the field, the Mariners played exceptional baseball, making several outstanding plays that allowed them the chance to rally late. Dee Gordon made a brilliant diving/sliding catch in center. Robinson Cano made multiple plays that were key. 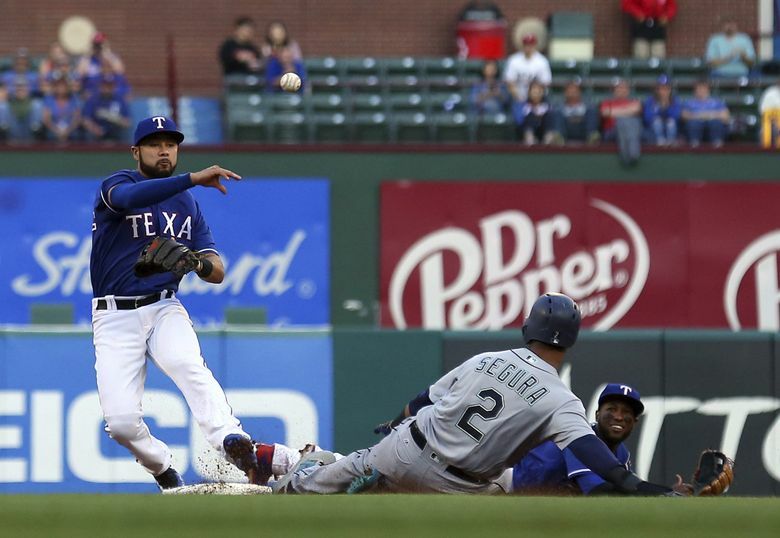 But it was a diving stop on a one-hop rocket off the bat of Adrian Beltre in the eighth inning that Cano turned into an inning-ending 4-6-3 double play that might have saved the game. Indeed, it kept the game tied at 2-2 and allowed the Mariners to finally get going in the ninth. Daniel Vogelbach started the rally, hammering a laser off the wall in right-center. Because of how hard the ball was hit and his known lack of foot speed, Vogelbach settled for a single and was replaced by pinch runner Andrew Romine. The Mariners bunted Romine to second and then got a single from Gordon. After seeming incredulous at a pair called strikes after working a 3-0 count, Segura knifed a line drive into right-center that scored both runners easily. From there, the offense kept piling on insurance runs. 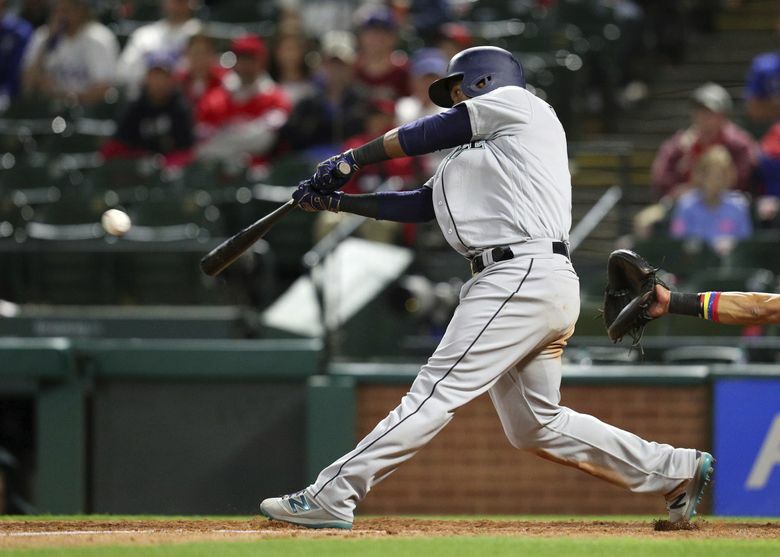 Kyle Seager ripped a line drive single to right to score Segura while Mitch Haniger tacked on another run with a run-scoring single to center — his third hit of the game. 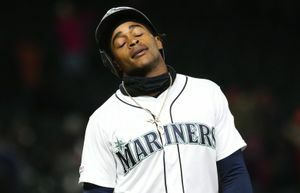 The Mariners got a solid start from Felix Hernandez, who worked the first five innings scoreless, allowing just two hits and using his entire repertoire to get a mixture of groundball outs and strikeouts. He finally wobbled in the sixth inning while trying to prolong a 1-0 lead. Hernandez gave up a leadoff double to Shin Soo-Choo — just his third hit allowed in the game — and then left a 2-2 curveball up in the zone that Nomara Mazara dumped into left for a one-out single that tied the game. “It was down, really down and he put a good swing on it,” Hernandez said. A misplaced changeup that hit his good friend Beltre in the hip ended Hernandez’s night one batter later. He didn’t get much immediate help from his bullpen, specifically left-handed specialist Marc Rzepczynski, who hasn’t been very adept at getting left-handers out of late. Rzepczynski gave up a single to right to lefty-hitting Joey Gallo and a hard fielder’s choice to lefty-swinging Ronald Guzman that allowed another run to score to make it 2-1. But Nick Vincent stopped the Rangers from adding on more. He struck out Robinson Chirinos to end the inning and struck out the side in the seventh. The Mariners seemed destined to be held to just one run for the fourth time in six games, wasting opportunities and changes. But Haniger smashed a solo homer to deep center with two outs in the eighth to tie the game at 2-2 off of right-hander Chris Martin. Haniger leads the team with five homers this season. And it helped offset a bad baserunning mistake earlier in the game where he led off with a double, but then broke too early on an attempted steal of third and was thrown out easily.